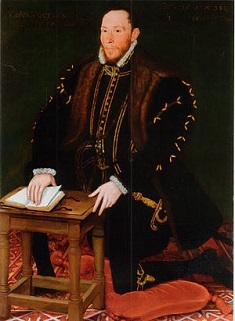 On this date in 1572, Thomas Percy, 7th Earl of Northumberland, lost his head for treason. The latest patriarch of a northern family illustrious in rebellion, little Tom was all of nine years old when his father the 6th Earl of Northumberland got his own head lopped off for rising in support of the Pilgrimage of Grace. That was back in 1537, but the ensuing decades had scarcely settled the realm’s religious strife … much to the profit of these here morbid annals. Like his father, Thomas Percy was a chip off the Old Religion’s block. That suited everyone just fine as the young man earned his spurs in war during the reign of the Catholic Queen Mary. Everything got awkward again when Mary died childless and left England to the Protestant daughter of Anne Boleyn. Catholic hopes accordingly attached themselves to Mary, Queen of Scots, who soon became mired in — and then defeated by — a civil war. While Mary still fought her corner there was at least a Catholic monarch afoot in the land; when she was beaten she had to surrender herself to the English. This rebellion was handily defeated and not a few of the couple thousand followers cobbled together by the aristocrats faced summary nooses for their treachery (for instance, 66 of the garrison that the rebel lords made bold to plant at Durham were executed when that city was recaptured). The lords, however, escaped to Scotland and sought passage out of England. Westmoreland made it;** his partner was caught in Scotland in 1572 by Regent Moray and turned over to English justice. Herafter, hopes of Catholic restoration reposed not in civil war but in conspiracy … where they fared just as poorly. * She never did: Mary made her exit from prison courtesy of the scaffold. ** Westmoreland died in the end the penniless — but never-executed — exile dependent of the King of Spain. Westmoreland’s wife, however, would live to see her brother Thomas Howard executed for the 1572 Ridolfi Plot, another Catholic conspiracy.